The library welcomes and encourages gifts in support of the College’s programs. Donors help sustain the library’s growth, and many of its most valuable resources and special collections originated in this way. 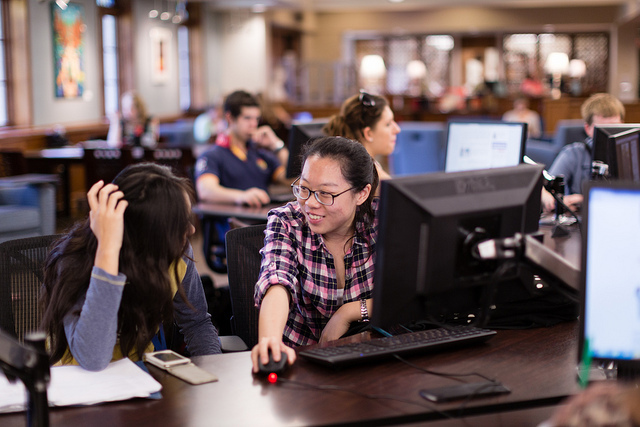 Gifts of money, books, films, and other research materials contribute to the library’s development and help us to provide the Rollins community with the best possible access to information. The Olin Library welcomes contributions of cash or long-term, appreciated securities, which can be used to establish either expendable or endowed funds that support library resources, services, or facilities. The Book-A-Year program builds endowments to strengthen the Library's collections. Once a gift totals five hundred dollars ($500.00), for either a memorial or a membership, a book is purchased at regular intervals and a bookplate is affixed, if desired, to recognize the donor(s) and the honoree. Please note that for security reasons, we cannot accept credit card information via e -mail. A donation of $500, payable in installments over two (2) years, establishes a permanent endowment and enables Rollins College to purchase a book at regular intervals. An appropriate acknowledgement of your donation will be inserted and searchable within the library catalog, indicating the name of the donor, honoree, or a gift of friends in memory of the deceased. You can donate online via our secure e-commerce system, or mail in your donation. The library accepts materials that support the College curriculum and the educational and research needs of our students and faculty. Rare books and titles that broaden and deepen our existing collections are welcome. Photos, scrapbooks, or personal papers related to the history of the College are collected by the Department of Archives and Special Collections, which also welcomes research materials related to state and local history. Due to the cost of processing and storing titles, the library seeks to acquire only materials that are highly relevant to the College's needs. Textbooks, workbooks, and study guides. Multiple copies of a single title. Books that are heavily annotated or underlined. VHS films, unless required for a specific course. Any gift given with strict stipulations. Financial contributions to defray the cost of processing your gift would be gratefully received. Donors of large gifts may be asked to provide funds to support processing and cataloging. If a gift is accepted, the donor will be asked to complete a Donation Form that legally transfers ownership of the gift. Click here for a copy of the Donation Form. Items are generally transported by the donor, but arrangements may be made for the pickup of large donations. We reserve the right to decline gifts that do not meet our collection development guidelines. To claim a charitable deduction for such a contribution, the donor must either estimate the value of the gift or have the books or materials appraised by a qualified appraiser. Under current tax laws, the Olin Library cannot provide this appraisal for its donors. You may wish to consult the list of appraisers found at Abebooks.com or search the Antiquarian Booksellers Association site. Donors may also wish to consult a tax professional or the U.S. Internal Revenue Service website at http://www.irs.gov/ for more information regarding charitable contributions. We will acknowledge your gift in writing. Please note that the library cannot provide an inventory or count of the items donated. If you require a list or count of the titles donated, please prepare this information before transferring materials to the library. Materials added to our collection are specially flagged in our online catalog to identify their donor. Donated items become the property of the Library, and the Library reserves the right to make any decisions regarding their use and disposition. Upon further evaluation, the library may determine that some items are not suitable for our collections. Donated items that are not added to our holdings will be offered to The Book Network, an organization founded by a Rollins graduate to promote education in the developing world. Titles not accepted by The Book Network Project may be sold, or, if necessary, discarded. If you are unable to accept our guidelines as a condition of your gift, we will be happy to suggest other possible recipients. The Archives and Special Collections accepts donations of materials related to Rollins College and Florida that fall with its collection development policy and financial support of our work. For more information concerning donations to the Archives, please contact the Head of Archives and Special Collections at 407-646-2231 or wzhang@rollins.edu. You can make a secure donation through the Rollins e-commerce system.